Experience and Education Set the Foundation for Leadership. This is a detailed breakout from our recent report on the Corporate Innovation Imperative, over the coming months, more will be revealed about how large companies are behaving like startups –while using their unique capabilities as a large organization. Attracting the right talent for innovation is a challenge for corporations competing with shiny, agile startups, as is long-term employee retention. Innovative corporations are building innovation talent pools by offering interesting programs, intrapreneur growth, and worthwhile incentives. Because, without a focus on attracting and maintaining innovation leaders, corporations are left seeking a hero to guide their journey toward change. In the report, we analyzed more than 140 LinkedIn profiles of individuals responsible for corporate innovation in varied industries and countries in order to create a persona of the average corporate innovation leader. Use these characteristics to guide your hiring and talent acquisition process, as well as gauge when leaders may be seeking opportunities for advancement or new challenges. The term “Tundra” emerged as a common theme among corporate innovation leaders, as they described company culture, and specifically, middle management as the “frozen middle layer” or “Tundra” or other similar metaphors of a dense, rigid, cold layer. A more biological metaphor included “antibodies” that are designed to raise barriers to corporate risk. These are very creative, passionate, and motivated professionals. Time spent in current role: 3.2 years. This shows that innovators need to know the business, as well as internal stakeholders, before generating new ideas. They must have credibility to sell up to executives. Many were recently hired from the outside, to shake up the inside, some have entrepreneurial backgrounds. Duration of career: 18.6 years. 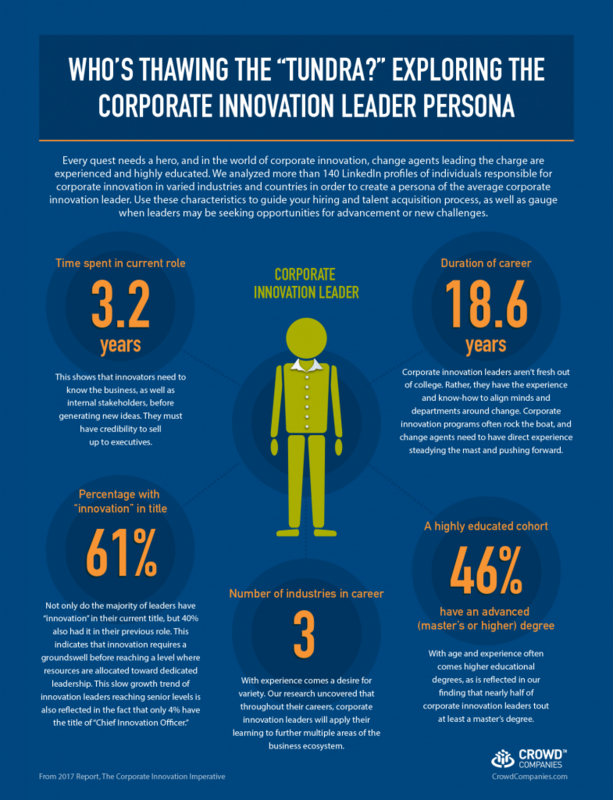 Corporate innovation leaders aren’t fresh out of college. Rather, they have the experience and know-how to align minds and departments around change. Corporate innovation programs often rock the boat, and change agents need to have direct experience steadying the mast and pushing forward. Much of the success of innovation teams depends on internal alignment among tangential departments, like legal and marketing, to move from ideation through implementation. Number of industries in career: 3. With experience comes a desire for variety. Our research uncovered that throughout their careers, corporate innovation leaders will apply their learning to further multiple areas of the business ecosystem. A highly educated cohort: 46% have an advanced degree. With age and experience often comes higher educational degrees, as is reflected in our finding that nearly half of corporate innovation leaders tout at least a master’s degree. Mature corporations understand that an innovation program is only as good as the employees behind it. Follow in the footsteps of corporations like Verizon, which has multiple innovation teams in various business units, each with talented members dedicated to both ideation and execution. This helps them move efficiently to prototype and launch new innovations. Also focus on talent retention, as there’s a commonplace and ever-present threat that your best and brightest will be poached (or, at the very least, approached) by competing corporations or startups. Leaders at mature organizations consistently ask themselves, “Are we doing enough to keep our most innovative employees happy?” The most effective incentives tie employee progress on innovation KPIs directly to pay structure. I’ve even heard from these innovation leaders, that they’re willing to risk their jobs at their companies to make significant changes, despite butting up against the culture of non-change. One leader commented “I’m backing on my employability –not my employment” when I take risks. This entrepreneurial mindset is a key one to properly manage, and clear internal roadblocks for if an employer wants to retain these go-getters. If you want to connect with fellow corporate innovation leaders, we, at Crowd Companies have hundreds of members that have this specific role, in our peer to peer council, who meet at our events, online, and beyond.